I threw this together one night trying to use up produce before going out of town. Who knew it was going to be such a hit! Now it’s a go-to recipe that I use when I don’t have much time to cook or wash dishes. In a 12-in. skillet, heat oil over medium-high heat. 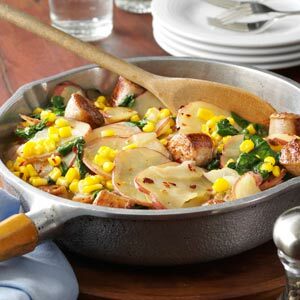 Add sausage and onion; cook and stir until sausage is browned and onion is tender. Add garlic and pepper flakes; cook 1 minute longer. Add potatoes, corn, broth and pepper; bring to a boil. Reduce heat; simmer, covered, 12-15 minutes or until potatoes are tender. Add spinach; cook just until wilted. Yield: 4 servings.